We all love to being able to self-diagnose, right? Solve problems ourselves? Well, now we're going to help you be the expert of your own PC. 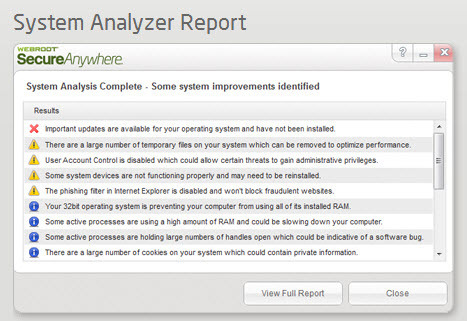 Our new tool, System Analyzer, looks inside your system and gives you a fast yet in-depth report of everything from undetected infections to memory issues. 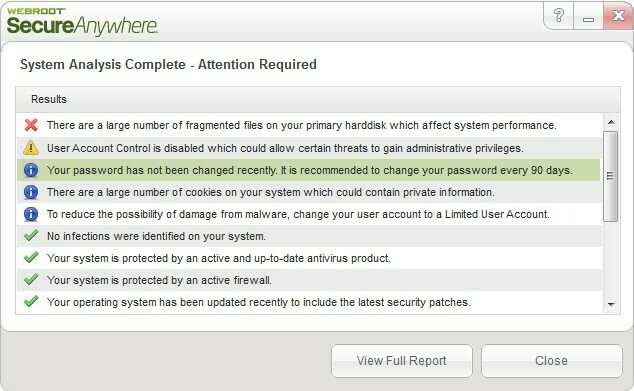 You can run it at any time to assess the health and security status of the PCs in your environment. Enjoy this free tool and let us know how your report comes out! . . . . . . . . . . . . . . . . . . . . . . . . . . . . . . . . . . . . . . New to the Community? Here's tips for getting started. 1. I use SSD drives so there are no Fragments! 2. I don't use UAC and never will! 3. I use strong passwords! 5. And I will not use a Limited account! The suggestions offered are 'recommended' it does not mean that it applies to all users. SSD (Solid State Drives) File Fragmentation can occur, although it happens differently than it does on the traditional mechanical disks. However, the performance decrease isn't as obvious either so it's less of an issue with SSD's. To simplify this, if you delete a file that is 1MB in size, and then request for a file 1.5 MB in size, if the file system is unable to find contiguous space for that file, you could have 1 MB sorted in one location of physical location on disk, and .5 MB stored on another. Again, this doesn't happen as frequently on SSD's but it does happen. The performance degradation also isn't as high because there is no physical read head that has to move across the disk. If running Windows under a limited use account it can reduce the number of potential infections that can gain a foot hold on the system. Additionally, UAC (User Access Control) can also provide a stop gap when running new software, or requests through Windows. It provides an additional "Are you sure you want to install this software? “While WSA will check these files for malicious content upon execution, UAC still provides a check when verifying if you requested an action. Strong passwords are always a good thing, but frequently changing them can also be a good security plan as well. Many IT Departments in the enterprise market have this configured per policy. Cookies are in fact harmless; however, they can contain information about browsing habits. They can also be useful. It is entirely up to the user to determine their comfort level with Cookies. Secure Anywhere Essentials and Complete includes the System Cleaner which can take care of these items automatically. In conclusion, these are only 'recommendations' that can be completed fairly simply within Windows and CAN increase performance and security. While each person's comfort level is different with their computer, no automated tool can include these variables. Thanks for the feedback however!! And for your participation in the forums! I agree with your assessment that's why I said IMO and I don't suggest non Tech type users to turn off UAC or not use a limited account if they desire! And for the SSD's I use Diskeeper 2012 with Hyperfast to keep the free space optimized! And it a nice free tool for users just to check there systems Thanks! I want to make sure regarding the license. We have contractors servicing customers. Is it ok for these contractors to recommend their clients to download and use this tool. Any license restriction here? Hello patrick421 and Welcome to the Webroot Community Forums! Check out the System-Analyzer Page and click on the license agreement at the bottom if you were going to Register to be sure! These license agreement are sometimes written in a way that makes it difficult to read for the common mortal. It is available and free at this time so there is no reason why you shouldn't be able to use/recommend it.